Christmas is fast approaching, and each year I receive messages from a combination of fellow vegans asking for advent calendar alternatives and non-vegans wincing at the fact that they can’t have a ‘proper Christmas’ without chocolate. Advent is traditionally the build-up phase to the celebration of Christmas and, in the UK, we have calendars (usually cardboard boxes with flaps) with small chocolates or gifts inside them. Each day - usually 1st December to the 24th December - is a chance to open up your flattened or boxed calendar to receive a little gift - or in the past, an image, picture, quote or Bible passage. This year, I’ve discovered there’s no shortage of vegan options when it comes to advent calendars, and I think I’ve found some of the best ones around. I’m half starting to regret this blog post though - stop and picture how many miniature chocolates I’ve had to eat …all for a good cause though. Let’s get started on some of this year’s offerings! Divine Chocolate’s dairy-free calendar is exactly that: divine! What a treat this was to try (I’ve saved days 3-24 for Peppe as he’s claimed it). This is the only calendar on my list that features a fun fact on the inside of each calendar window - just like the ‘old school’ calendars. 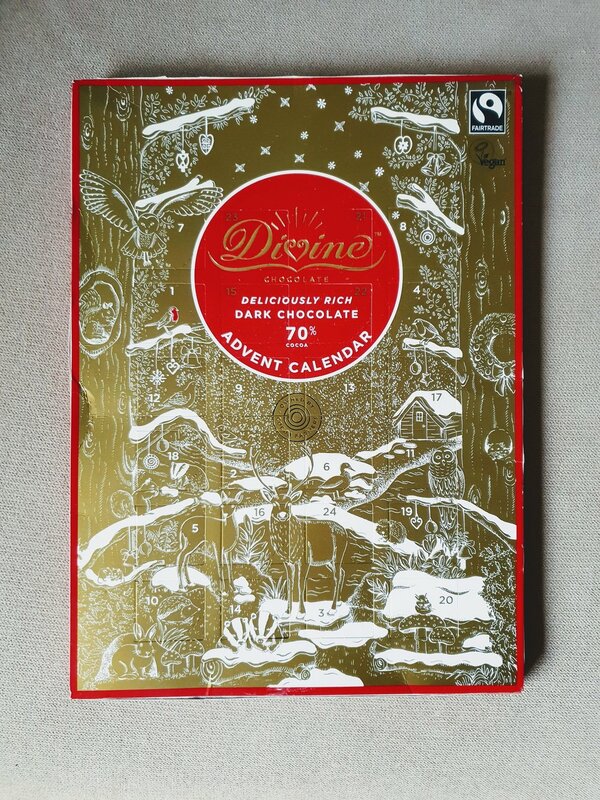 Alongside this, Divine Chocolate’s calendar features a tinfoil-covered 70% dark chocolate treat - no dairy in sight. At a reasonable cost, you get quality chocolate throughout the season of advent, plus they support the empowerment of women through their fairtrade work. Key Info: Reasonably-priced advent calendar with premium chocolate and a fun fact! I’ve eaten five of these chocolates and it’s not even December 1st yet. This calendar not only looks amazing, but the ‘truffles’ inside are very special! Nono Cocoa are a wonderful dairy-free, gluten-free, nut-free, egg-free, artificial-colouring-free, GMO-free brand who trade ethically and work with people with autism who hand-finish each truffle. It says ‘truffle’ on the pack, but in my mind, truffles have a soft centre - maybe that’s my upbringing of Celebrations chocolates at Christmas though! These (of the ones I’ve tried so far) aren’t soft inside, but they are absolutely delicious. The flavours are really creative too, and include coffee, lime & matcha, rose, cinnamon and many more! Key Info: A vegan advent calendar with a 14 different flavoured thick chocolates, finished by hand and ethically produced. This is the first of two choices from Plamil, a company whose main focuses are nutrition, ethics and the environment. This calendar offers a great alternative to white chocolate. Since the 1960s, Plamil have taken pride in their transparency in the industry and they adhere to strict standards, certified by organisations such as Fairtrade Foundation, Soil Association, UTZ and they’re certified Kosher too. This cheerful vegan calendar is a great option for kids (and adults) looking for an affordable option for a dairy-free advent. Key Info: Made from sugar, rice and cocoa butter, this vegan, gluten-free calendar is great for both children and wannabe-children. Now for something a little different, LUSH’s 12 Days of Christmas isn’t exactly an advent calendar, but it’s a big, pretty box bursting with LUSH goodness. Perfect those who don’t have a sweet tooth, but love a cruelty-free pamper session. The box comes with 12 gifts inside (all vegan) featuring bath bombs, shower gel, body conditioner and more. You can expect the box to be more expensive than regular advent calendars as it features a whole 12 separate, full-sized gifts, but gifting a box with a plethora of treats is a great way to put a smile someone’s face, and these treats aren’t the type that disappear as soon as you discover them like advent chocolates! This would make a great gift for someone looking for an alternative advent but, unlike the other calendars on this list, it would be just as suitable to gift someone on Christmas Day (there are no numbers on the box). Does this take away some of the magic of advent? You decide - but LUSH’s 12 Days of Christmas sure is a (non)sweet treat to receive! Key Info: 12 vegan cosmetic products in an un-numbered gift box - ideal for adults, teens or someone who deserves an indulgent bath! The second of two vegan advent calendars from Plamil. This calendar has all the taste of dairy milk, but obviously without the dairy. Once again, Plamil offer a festive and fun-looking calendar produced with zero cross-contamination (as dairy isn’t handled in their factory), so it’s suitable for those with an allergy to dairy. This calendar comes in at the same price as their White Chocolate Alternative calendar - so the choice is yours! This one reminds me of Milkybar buttons! Key Info: Made from rice, sugar and cocoa butter - this advent calendar is a great way to introduce vegan chocolate to a little one who would otherwise be eating a dairy advent calendar. Not into chocolate but still want the magic of opening little numbered flaps each morning? The Candy Kittens calendar houses fully vegan, gluten-free, gourmet sweets, made with natural fruit juices, natural colourings and natural flavours. Flavours range from blueberry bliss to sour watermelon, and the real bonus is that the calendar has 28 days instead of 24, for a few extra days of sweetness after Christmas Eve. Key Info: Made from natural flavours and colours, you get 28 days of treats instead of the usual 24. We’ve kept three calendars for our own household: the Divine Chocolate one for Peppe (he likes simple dark chocolate), the Nono Coco for me (the variety of flavours is great!) and the Lush calendar - some of the bath bombs in this calendar will be gifted as presents in themselves, as we don’t get the chance to have indulgent baths too often as new parents! All of these calendars are great options, it just depends what you’re looking for. I’d say the Plamil calendars are the most suitable for kids, the Candy Kittens for teens, the Divine and Nono Coco for adults and the Lush one makes a lovely big Christmas gift for a bath addict. Have you tried out any of these advent calendars? What do you think of them?